Introduction: An expanding neck hematoma following thyroidectomy is a rare complication requiring urgent airway management and potential bedside evacuation before definitive surgical intervention. Due to its rare occurrence and life-threatening consequences, appropriate crisis resource management and a systematic approach are critical for patient safety. Methods: In this simulation scenario using a high-fidelity mannequin, a 68-year-old male presented with an expanding cervical hematoma 2 hours after a total thyroidectomy. The target audience was junior residents (PGY 1, PGY 2) in otolaryngology–head and neck surgery. Residents were given a case stem to encourage active information gathering through history and physical examination. Setup and flow of the scenario were designed for residents to prioritize establishing an airway through bedside decompression of the hematoma prior to making operating room arrangements for definitive management. Standardized patients playing a ward nurse and patient family member added complexity to the case. Results: Since 2012, the simulation has been used with a total of 96 residents as part of an annual boot camp. Surveys conducted after the boot camp verified the effectiveness of simulations in learning and, specifically, the usefulness of this scenario. Discussion: Simulation-based training is an effective learning modality for critical cases in health care disciplines involving emergency airway management. A well-developed simulation that closely resembles a real-life scenario is essential in creating a rich learning environment for trainees. Our scenario can be a valuable resource for other institutions implementing simulation-based training as part of their medical education. Manage an expanding postoperative hematoma with urgent intubation and bedside hematoma decompression. Identify the need to make arrangements for definitive surgical exploration with return to the operating room. Utilize effective closed-loop communication to direct ward nurses in aiding with patient management. Recognize the need to incorporate and notify other team members, including anesthesia, senior otolaryngology–head and neck surgery (OTO-HNS) resident, and staff OTO-HNS consultant. Incorporate the multidisciplinary team by asking for further input and maintaining professional relationships in a stressful situation. An expanding cervical hematoma is a rare but potentially life-threatening complication of thyroid surgery. The reported incidence of hematoma after thyroid and parathyroid surgery is 0.19%-2.10%,1 with typical presentation within 36 hours.1,2 The key to successful management of a patient with an emergent expanding hematoma is prompt airway management and urgent reexploration and evacuation of the hematoma, either emergently at the bedside or in the operating room. The development of a postoperative hematoma is more common after total thyroidectomy compared to lobectomy,3 after difficult extubation with excessive coughing or emesis,4 with anticoagulant usage,5 and in patients with postanesthetic systolic blood pressure over 150 mm Hg6 or large dead spaces.2 The routine use of drains to prevent hematoma and seroma complications after thyroid surgery has been controversial. Currently, there is no evidence that drain usage improves patient outcomes, and drains have been associated with increased time in hospital and postoperative infection.7,8 Meticulous hemostasis during surgery and vigilant observation postoperatively are critical to avoiding complications and improving patient safety. Given the rare occurrence, emergent nature, and potentially fatal consequence of an expanding hematoma, it is important for a learner to understand appropriate crisis resource management and to develop a systematic approach to a postthyroidectomy hematoma. As thyroidectomies are frequently performed on an outpatient basis, many patients who develop a postthyroidectomy hematoma may return to the emergency department within a 36-hour window. Simulation-based training (SBT) has previously been established as an effective tool in teaching management and teamwork in emergency situations.9-11 In particular, SBT can be useful in training junior residents about rare medical complications.12,13 Use of SBT in otolaryngology–head and neck surgery (OTO-HNS) is well described in the literature; however, the majority of descriptions focus on specific procedures such as temporal bone surgery using virtual reality models, microlaryngoscopy using silicone models, and cricothyroidotomy and tracheostomy using both real and virtual models.14-16 There is currently no detailed simulation scenario for the management of a postthyroidectomy hematoma. Our simulation scenario allows junior residents in OTO-HNS, anesthesiology, and other surgical specialties to practice technical and nontechnical skills of crisis management in a controlled environment without compromising patient safety. The current scenario was first developed for the Canadian Emergencies in OTO-HNS boot camp held since 2012 in London, Ontario. The boot camp and the simulation scenarios were designed for first- and second-year residents in the OTO-HNS program in Canada as well as for other learners of equivalent training.12 Residents were expected to have medical knowledge and clinical skills appropriate for their level of training. For maximum efficacy and realism, the current scenario required a high-fidelity mannequin such as the SimMan 3G (Laerdal Medical Canada, Toronto, Ontario) or another similar simulator. The hematoma packet was created with artificial blood using low-cost materials such as saline, red food coloring, and corn starch enclosed in a small sealable plastic bag. This hematoma pocket was embedded in a craft foam background for stability and covered with strap muscles and artificial skin placed over the mannequin’s neck. The Neck Skin Kit (Laerdal Medical Canada, Toronto, Ontario) or other similar product can be used as the artificial skin (see Appendix A). Monitors including noninvasive blood pressure cuff, cardiac monitor, and pulse oximeter were required for learners to follow the SimMan’s vital signs. Other required equipment within the simulation room included patient chart containing operative note; intravenous lines, tubing, and fluids; stethoscope; surgical gown, hat, mask, and gloves; gauze; suction; bag valve mask; oral airway; minor procedure tray including scalpel; tracheostomy tray; adult intubation equipment (#6, 7, 8 endotracheal tube); and a laryngoscope. The patient, represented by the SimMan 3G, was a 68-year-old male named Frank Marshall and initially presented with a palpable thyroid nodule of approximately 5 cm diameter. Following fine needle biopsy and pathology report indicating the presence of papillary carcinoma, the patient decided to undergo a curative total thyroidectomy.9 The surgery was completed without any intraoperative complications, and he was first moved to the postanesthesia recovery unit with a single large bore IV in place and subsequently transferred to the inpatient floor. His past medical history was significant for hypertension and type 2 diabetes mellitus. There was no significant family history of thyroid disease. His medication list consisted of 500 mg metformin, 5 mg of Ramipril, and over-the-counter use of low-dose aspirin. Detailed review of systems including laboratory results is included in Appendix B. Roles for different health care professionals were included in the scenario to allow trainees to work cohesively within a multidisciplinary team. Individuals in the learner group took on the roles of a junior resident, a senior resident, and an anesthesia resident, who were available to enter if requested by the team or could be called upon by a ward nurse to enter the scenario. Other participants in the simulation (confederates) included a ward nurse and a family member. The ward nurse was first on the scene and alerted the surgical team to enter the room. The learners decided who would lead the scenario as the senior resident and entered as a group. The team was told that Frank had had surgery 2 hours ago and, when walking back from the washroom, started to feel more light-headed. Collateral history was provided by the patient’s family member and the patient chart available at the bedside. The nurse further suggested to the learners that Frank’s neck appeared more swollen. The nurse helped the learners find what they were looking for but left the room if the team asked for intubation medications (propofol, succinylcholine, rocuronium, ketamine, phenylephrine) in order to simulate the time required to draw up and retrieve medications on the ward. Similarly, the nurse left if the team asked for a cardiac arrest cart. All other equipment was located within the room. The family member was sitting in the patient’s room with Frank and occasionally interrupted the nurse and learners. The family member became more distressed and increasingly agitated when the learners decided to open the incision at the bedside. If at any point a learner addressed the family member directly and politely asked him/her to leave, the family member complied. As the family member became louder and more agitated, the ward nurse could offer to take him/her outside if the team did not suggest it. If the group appeared to be struggling, the nurse offered equipment availability of stethoscope, minor procedure tray, and laryngoscope to help the scenario progress. When the learners began to discuss examining the airway or preparing to intubate, the ward nurse was hesitant and questioned whether the residents should wait a bit longer to see if the patient recovered in order to encourage learners to have confidence in their decision making. The scenario occurred on the inpatient ward. Each team participating in the simulation scenario comprised three or four residents. The case stem provided for the team before entering the rooms was this: “You and your team are carrying out afternoon rounds on the surgical ward. All surgeries are completed for the day, and you are rounding on your postoperative patients from the day.” The ward nurse met the residents outside the patient room with concerns that Frank had experienced significant dizziness walking back from the bathroom. When the team entered the room, Frank was lying in the bed, with a family member sitting by his side. There was an obvious thyroidectomy incision closed with interrupted sutures. The SimMan’s airway was set to be edematous and difficult, though not impossible, to intubate. Initially, when students entered the simulation room, one large bore intravenous line was connected to the SimMan. Learners were expected to retrieve the relevant clinical information during the simulation from the patient chart, ward nurse, and other confederates in the scenario. Learners also had to take appropriate actions and give instructions to the nurse as required for patient management. The edematous airway continued to worsen over the course of the scenario until the thyroidectomy incision was released. After hematoma drainage, the SimMan’s saturation improved slightly but did not return to baseline, as venous congestion from the rapid expansion of laryngeal tissues continued to cause respiratory distress. The suggested flow of the simulation activity is summarized in Appendix B. The duration of the simulation was 10 minutes for setup, 15-20 minutes for the simulation, and 15 minutes for the debriefing. Through a guided debriefing session, learners were encouraged to discuss their experience of the scenario, including their decision-making process, strengths within the group, and areas of future improvement. Specifics in the medical management of a postthyroidectomy hematoma were highlighted, emphasizing the need for decisive action for bedside hematoma evacuation in a decompensating patient. Discussion about team dynamics, communication strategies, areas for future improvement, and difficulties experienced was encouraged. Specific guiding questions are included in Appendix D.
The described postthyroidectomy hematoma simulation has been conducted as part of the annual Emergencies in OTO-HNS boot camp since 2012 in London, Ontario.12 In 2012, using a 5-point scale (1 = strongly disagree, 5 = strongly agree), the 11 participants in the simulation rated the statement “The post thyroidectomy hematoma scenario was useful” an average of 4.82. In 2013, using the same 5-point scale, the 21 participants rated the item “The postthyroidectomy simulation was realistic” as 4.33, the item “The simulation was effective in teaching communication skills” as 4.52, and the item “The debriefing was effective” as 4.48. From 2014, we optimized the participant feedback forms and removed numerical assessment of specific high-fidelity scenarios, instead requesting general feedback and other learner suggestions. Questions in the updated evaluation form included “What was the most important thing you learned today?” Among the answers was “A good team communication is essential to manage a critical situation like an airway obstruction. I have learned critical skills that will be relevant to my practice technical and medical abilities” (2014), suggesting effectiveness of the current simulation in teaching various skills to residents. Other comments included “Simulations were great to organize priorities” (2015) and “Airway management in stressful situations” (2015), again showing that these high-fidelity simulations are an effective teaching method for junior residents who may not yet have had as much experience in handling emergency airway situations. The evaluation survey used to collect data from participants is included in Appendix E.
Over the years, this simulation has undergone adjustments based on assessment of learner performance to produce the final scenario described here. Formal assessment of the learners’ medical knowledge was not conducted; however, their nontechnical skills were assessed using the NOTSS scale. 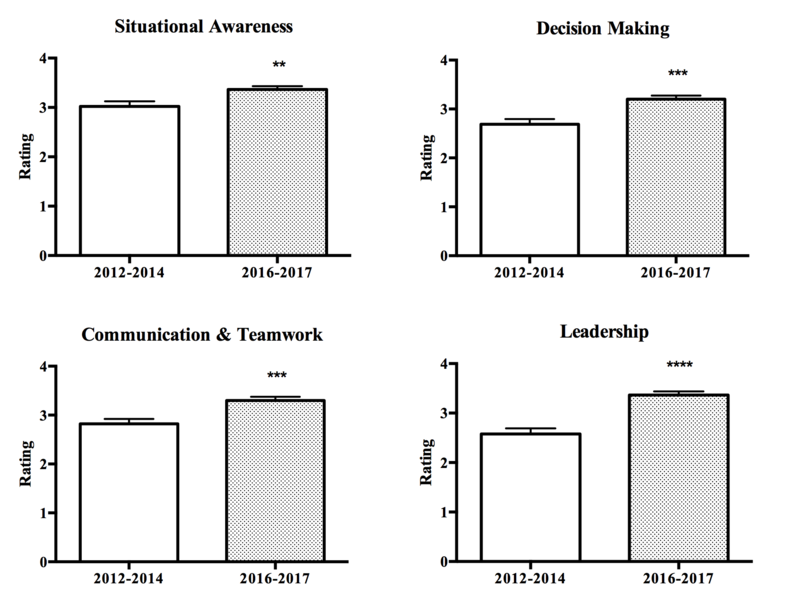 Over the years, each cohort of participants demonstrated a measurable improvement in nontechnical skills performance, indicating that removal of excessive distractors allowed better performance and situational awareness (Figure). Because this scenario was conducted with junior (PGY 1 and PGY 2) learners, the focus was on core skills of identification of an airway emergency and coordinating the team for bedside management. The distractors, described further in the Discussion section, can be added to increase the scenario complexity for more senior learners. Student’s t test. **p < .01. ***p < .001. ****p < .0001. We developed a postthyroidectomy hematoma scenario that was effective in teaching junior OTO-HNS residents both the technical and nontechnical aspects of emergency airway management. SBT is established as an effective teaching tool for rare but urgent scenarios.11,20,21 SBT has been successfully implemented in a number of surgical specialties, including anesthesia22,23 and OTO-HNS.11,12,24 Emergency boot camps in particular have been a useful modality for incorporating these simulations. The Emergencies in OTO-HNS boot camp was initiated at Georgetown University25 and has since expanded to multiple centers.12 This postthyroidectomy hematoma scenario serves as a valuable resource for institutions interested in incorporating SBT into their curricula. Earlier iterations of the scenario featured multiple distractors, including an overbearing staff consultant calling the room, an antagonistic nurse, and a hysterical and difficult family member. The consultant call, for instance, was designed to add further noise and chaos to the simulation and to draw the resident in the leadership position away from the patient. The intended goal was to create an opening for assertion of leadership by another team member. However, we found that such added complexity distracted the learners from focusing on the scenario, resulting in communication breakdown, role uncertainty, and poorer overall team performance. These previous iterations of the scenario may have been too complex and overwhelming for participants. Cognitive load theory posits that there is limited working memory within the human cognitive architecture.29,30 The availability of working memory acts as a bottleneck during learning, and excess cognitive load can be deleterious to learning. Cognitive load comprises three components: intrinsic, extrinsic, and germane loads. The intrinsic load is directly related to the complexity of the task at hand (assimilating patient information and clinical presentation to identify a postoperative complication). The extraneous cognitive load encompasses all other superfluous distractors within the task (family member questions, phone call from the consultant, and other interruptions). The germane load describes the actual learning process by which working memory is converted into long-term memory. The distractors in previous iterations of this simulation negatively impacted learning.29-31 Subsequent iterations of the scenario have minimized these distractions to streamline the situation. The principal limitations to the current scenario pertain to the SimMan mannequin and its discrepancies from a real human patient. Although the SimMan has been shown to be an effective tool for learning of general clinical skills by medical students,32,33 its airway can be perceived as low fidelity, especially by OTO-HNS and anesthesiology residents with extensive knowledge of human airway anatomy.34,35 Despite a room setup designed to recreate the environment of a true emergency, these discrepancies can affect trainees’ reaction to the scenario and result in decreased value of learning.34 Use of mannequins with realistic airway design and other props to improve the realism of the scenario is recommended. In conclusion, this postthyroidectomy hematoma scenario is a useful educational resource for promoting the incorporation of SBT into postgraduate surgical curricula. It may be of particular interest to programs adopting a competency-based medical education model, such as in the United States and Canada. Simulations have been shown to be an effective learning experience for participants according to not only the Emergencies in OTO-HNS boot camp surveys but also the literature demonstrating that simulation-based learning improves student knowledge, skills, and confidence.26-28 Our scenario has been designed to address multiple CanMEDS roles described by the Royal College of Physicians and Surgeons of Canada, such as Medical Expert, Communicator, Collaborator, and Professional.17 The current scenario can also serve as a template in developing other future simulations. The Western University Research Ethics Board approved this study. Frank JR, Snell L, Sherbino J, eds. CanMEDS 2015 Physician Competency Framework. Ottawa, Ontario, Canada: Royal College of Physicians and Surgeons of Canada; 2015. Holmboe ES, Edgar L, Hamstra S. The Milestones Guidebook. Chicago, IL: Accreditation Council for Graduate Medical Education; 2016. Yee B, Naik VN, Joo HS, et al. Nontechnical skills in anesthesia crisis management with repeated exposure to simulation-based education. Anesthesiology. 2005;103(2):241-248. Murray DJ. Current trends in simulation training in anesthesia: a review. Minerva Anestesiol. 2011;77(5):528-533. Holland C, Sadler C, Nunn A. Scenario design: theory to delivery. In: Riley RH, ed. Manual of Simulation in Healthcare. Oxford, England: Oxford University Press; 2008:139-154. Schebesta K, Spreitzgrabner G, Hörner E, Hüpfl M, Kimberger O, Rössler B. Validity and fidelity of the upper airway in two high-fidelity patient simulators. Minerva Anestesiol. 2015;81(1):12-18. © 2019 Wu et al.